Thousands hit the streets of San Diego Saturday to join the People's Climate March (PCM) at the downtown Waterfront Park. SAN DIEGO (CNS) - An estimated crowd of about 4,000 to 5,000 demonstrators including elected officials, students, faith leaders, and members of more than 50 local organizations gathered downtown Saturday for the People's Climate March San Diego, part of a nationwide effort that coincided with President Donald Trump's 100th day in the White House. The event began with a rally at Waterfront Park adjacent to the County Administration Center on Pacific Highway and was organized, in part, to call on local leaders to transition to clean energy sources and oppose federal attempts to roll back climate policies put in place by former President Barack Obama. The crowd marched south on Harbor Drive, east on Ash Street, south on Pacific Highway, west on Broadway and north on Harbor Drive back to the starting point. Marchers carried signs with slogans including "mother frackers!'' "I march for birds and bees and oceans and trees,'' "water is life,'' "people over profit,'' "protect earth,'' "100% clean energy,'' "respect mother earth,'' "make earth great again,'' "our planet can't sustain this government,'' "you can't drink oil'' and "save the frogs,'' among others. "There is no larger threat than climate change and the rebuke of this truth by the president and his administration is terrifying," Assemblyman Todd Gloria, D-San Diego, told City News Service. "While Washington denies the truth, California and San Diego will remain on the front lines of this fight by advancing policies that protect our planet like powering our communities with 100 percent renewable energy." 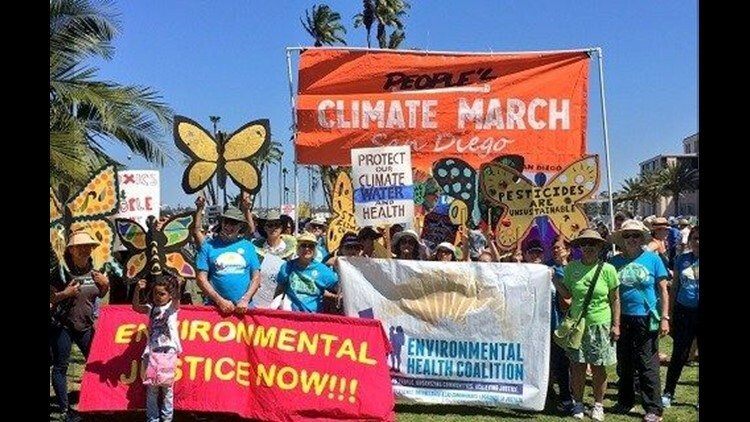 Some of the groups involved in the march included SanDiego350, Sierra Club, Environmental Health Coalition, Alliance San Diego, Surfrider Foundation, Greenlove SDSU, the Catholic Diocese of San Diego, and the San Diego and Imperial Counties Labor Council.